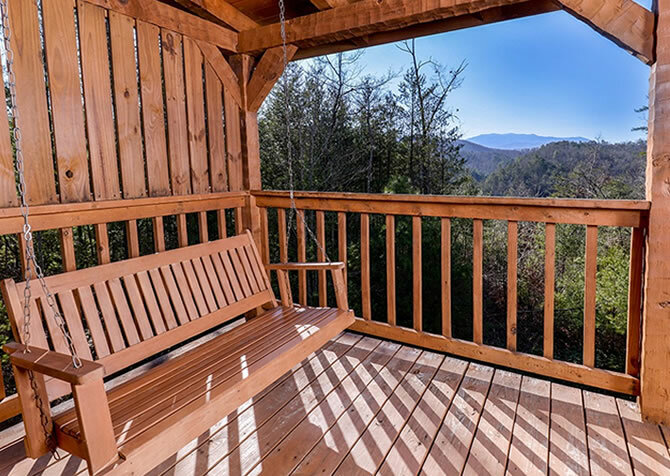 Inspiring views of the Great Smoky Mountains lie inside and out of the charming Little Smoky Dream, a lovely 1-bedroom, 2 ½-bathroom cabin in Pigeon Forge, Tennessee. Boasting cozy sleeping space for up to 4 guests, a fully loaded kitchen, and homey furnishings, this log cabin has mountain charm and modern amenities. Couples will love waking up to the gorgeous mountain scenery right through the large window at the foot of the cozy king-size log bed in the loft. 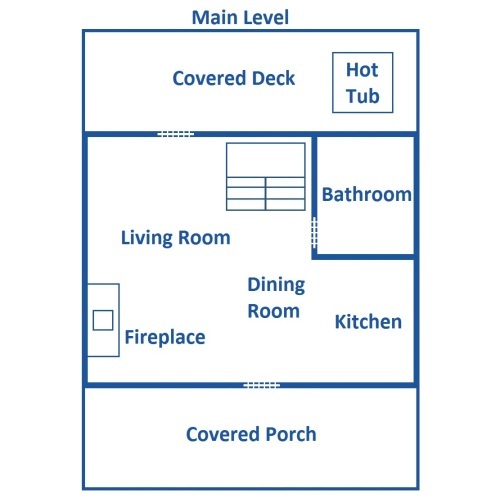 Families can appreciate relaxing spaces, games, and a place to call home when they’re away. 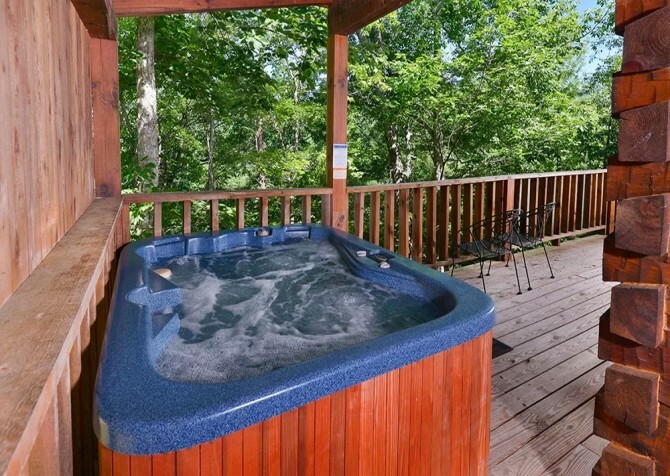 Homey touches turn your Pigeon Forge vacation into a cozy Smoky Mountain stay with conveniences often underappreciated. No need to pack dirty clothes in your suitcases after a scenic hike in the Great Smoky Mountains National Park with access to a washer and dryer right in the cabin! 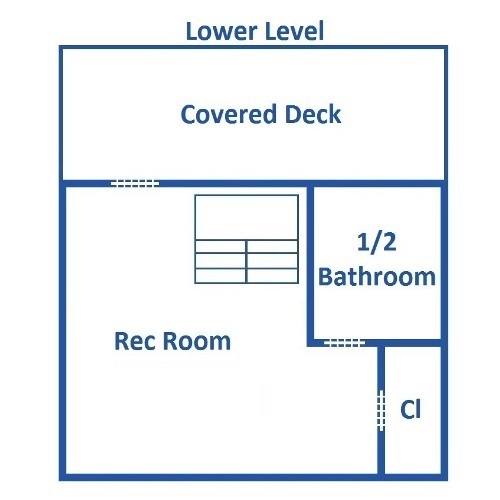 No racing up and down the stairs with convenient bathroom access on every level! Save money and spend quality time together while cooking in the fully loaded kitchen, sipping on fresh cups of coffee from the coffeemaker while enjoying mountain views on the deck, and watching movies on the large flatscreen TV. Make memories you will cherish while playing foosball against the kids in the recreational room, playing your favorite board games from home around the dining table without the usual distractions, flirting and playing pool and sipping on glasses of local wine, and waking up to breathtaking views each relaxing, fun day in the Smoky Mountains in Little Smoky Dream. Whether you are lost in a good book in the plush reading chair, sipping on a cup of hot cocoa on the sofa next to a warm fire, or cheering on your favorite team on the flatscreen TV, hanging out in Little Smoky Dream’s cozy living room feels intimately welcoming. Log walls, rustic wood furnishings, and a stone fireplace stretching from floor to ceiling lend guests all the natural elements of a gorgeous cabin. A flatscreen TV, CD player, DVD Player, and a warm fire provide the right amount of modern comfort to this serene atmosphere. 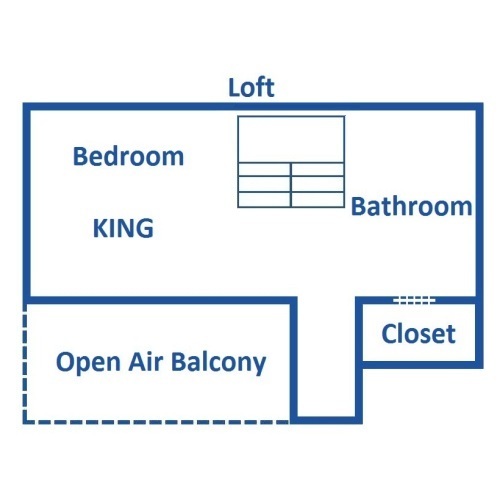 Enjoy being a little disconnected from technology and the distractions of home with a little family game of charades in the spacious living room while dinner cooks in the oven. With no distractions and plenty of kitchen tools conveniently provided, revisit the charm of preparing and eating meals together in this charming dine-in kitchen with pale wood tones and white appliances accentuated by track lighting. Reheat your leftovers from your favorite Pigeon Forge restaurants in the microwave for quick snacks when those midnight cravings creep in. A toaster and coffeemaker make breakfasts easy, and a table by the window is a peaceful spot for a meal before heading into downtown or hitting up the hiking trails in the Great Smoky Mountains National Park. Simple charm and an airy, open-concept atmosphere make Little Smoky Dream’s delightful little dining room the perfect spot for quick breakfasts while enjoying the morning news on the TV nearby and romantic candlelight dinners with an alluring fire in the fireplace setting the mood. Unpack your family’s favorite board games from home to play around the three-chair dining set before enjoying some homemade fried apple pies from The Apple Barn. Wake up to dreamy Smoky Mountain views at the foot of your bed in the enchanting loft bedroom before crawling out from under the quilted covers of your cozy king-size log bed. 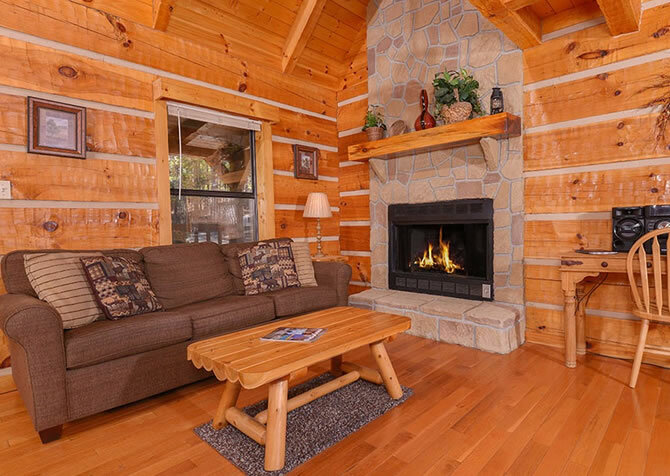 Squeeze in an afternoon nap in the soft natural lighting or kick back with some midday TV on the bedroom flatscreen on laid-back days in the cabin or in between Pigeon Forge excursions. Before crawling into bed, soothe tired muscles or simply enjoy the luxury of your large jetted tub in the bathroom boasting wooded views from the bath, a large vanity mirror and double sink, and closet to unpack suitcases and easy access to clothing after a shower. Pick up a bottle of your favorite wine or a growler of delicious craft beer from Smoky Mountain Brewery and head to the cabin for a fun night in the rec room over fun games of pool and drinks. Challenge your loved one or the kids to fun games of foosball, hosting your own little tournament at the table while the next competitors wait and cheer on the nearby sofa. The rec room’s sofa is also the perfect place for a quiet nap in the warm afternoon light peeking through the pines outside. 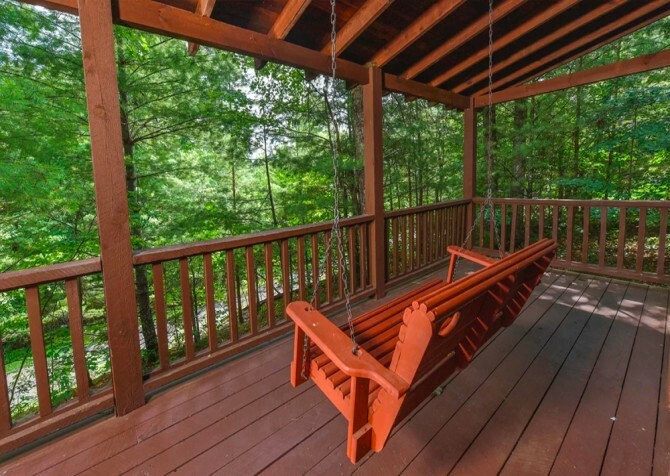 Savor every peaceful moment with your special someone while holding hands in the deck swing or sipping on cold glasses of sweet tea in the lounge seating on the back deck. As you sip your morning coffee, enjoy the serenity of the Smokies all around you. Let the steam of the outdoor hot tub carry away your stresses while soothing jets massage tired muscles during therapeutic evening soaks before bed each night. Like the taste of a smoky grilled steak? Pick up some charcoal and use the outdoor grill just a few steps from the front porch to cook up a delicious steak and veggies dinner. Incredible equestrian teams, acrobatic acts, serenading Southern sirens, and a mouthwatering 4-course meal all in one evening! For over 2 decades, Dolly Parton and her eye for talent has kept this show lively and electrifying for thousands of visitors to the Great Smoky Mountains; come and experience one of the best dinner shows around! Almost 3,000 miles of streams creep throughout the Smoky Mountains and fishing is permitted year-round! As one of the last wild trout habitats in the eastern United States, these streams stay stocked at their carrying capacity making for a prime fishing experience! With incredible views, rolling green valleys and foothills, and temperate weather, the Smoky Mountains are home to some of the South’s most notable golfing ranges with breathtaking landscapes and well-constructed courses that are fun for every skill level. "My husband and I stayed in Little Smoky Dream on our last trip to the mountains, which was my very first time. We couldn't have been more pleased with this cabin! Everything was perfect for us! The size of the cabin was great for a couple; everything was exactly as pictured and described. The view from the decks and bedroom window were beyond beautiful. It was wonderful to wake up to the sun creeping over Mt. LeConte every day! It was a little secluded, but that made me appreciate the…"
"My husband and I stayed in Little Smoky Dream on our last trip to the mountains, which was my very first time. We couldn't have been more pleased with this cabin! Everything was perfect for us! The size of the cabin was great for a couple; everything was exactly as pictured and described. The view from the decks and bedroom window were beyond beautiful. It was wonderful to wake up to the sun creeping over Mt. LeConte every day! It was a little secluded, but that made me appreciate the wonderful scenery even more. We had a very fat raccoon visit our front porch every night we were there, which we enjoyed. Staying at Little Smoky Dream cemented the Gatlinburg/Pigeon Forge area as my new favorite place to vacation. We are returning to Gatlinburg in just two weeks, with the entire family, to stay at Absolute Heaven. I recommend Cabins for You to everyone that I come across, and will only stay with Cabins for You when I visit the area!" "The cabin was perfect! It is out in the woods, has an excellent view, and is beautiful inside and out. The smell of the wood, the décor, the hot tub were amazing. The directions to the cabin were perfect. There’s quite a drive up the hill, but well worth it. The only complaint would be that the neighbors were closer than I would have liked. They were outside one evening talking loudly when we were in the hot tub, but the jets were able to drown them out."